SCOTTSDALE, Ariz. (AP) Thanks to the San Francisco Giants and Los Angeles Angels, baseball got a new twist on the old Abbott and Costello gag of "Who's on First?" For confused players and fans at Scottsdale Stadium on Friday, it was "Who's on Second?" A day after Major League Baseball announced it would begin extra innings by putting a runner on second base in spring training games, the Giants and Angels jump-started the experiment - they did it to start the ninth with the score tied at 5. Giants manager Bruce Bochy knew what was going on. Only one problem: He hadn't told his team. "For the rest of the spring, they're taking a look at it, so we did it today," Bochy said after the game. "Actually, I've got to tell them it starts today." So as Giants reliever Trevor Gott entered in the top of the ninth and began warming up, third base umpire Alfonso Marquez signaled to the Angels bench to put a runner at second. The split-squad Angels sent Jhoan Urena to the bag. "I turned around and asked the umpire, `Is he supposed to be here?'" Gott said. "He said, `Yeah,' but he looked like he was kind of joking. I was like, `For real?' He said, `Yeah, it starts today.'" In fact, MLB teams can mutually agree in exhibition play to begin the ninth inning of a tie game with a runner on second base by informing the plate umpire - MLB has asked each team to try it once. If the game is still tied after the ninth, the teams can agree to either end the game or play a 10th inning. The experiment is already part of the minor leagues. Designed to improve the pace of play, all levels of the minors began extra innings with a runner on second last year. It was done in the rookie level of the minors in 2017. With many fans asking each other what was happening, Gott struck out the Angels' Bo Way to start the ninth. Gott retired Torii Hunter Jr. on a flyball, moving Urena to third, and struck out Ty Kelly to end the inning. The Giants put Alen Hanson on second in the ninth. The Angels' Ryan Clark struck out Drew Ferguson, got Mike Gerber on a flyball, walked Levi Michael and set down Pablo Sandoval on a flyout to finish the inning. That was all, the game ended in a 5-all tie. "I would've tried to bunt (Hanson) over for Gerber there," Bochy said. "It just shows you how important execution is. We couldn't move him over there. That was the difference." Gott said he was in those situations quite a few times last year at Triple-A Syracuse. "It definitely makes it a lot tougher in terms of how you approach the batter at the plate, 100 percent," Gott said. "What I saw last year was bunt pretty much every time. That's what everyone did pretty much." Some teams intentionally walked the first batter to set up a double play, Gott said. "For here, it's OK," Bochy said. "I wouldn't want to see it during the season. It's a little different. I'm not sure everybody knew what was going on." Gott certainly didn't. When did he find out? "When it happened," Gott said. "When the umpire told me." 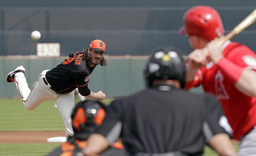 Giants pitcher Jeff Samardzija had another suggestion: eliminate extra innings completely and consider changing to a points system where teams are awarded three points for a win and each team receives one point for a tie. "We're playing 162 games and over that many games, you should be able to tell who the best team is," Samardzija said. "That makes the ninth inning exciting all the time. Who wants to go out and play 15 innings?" "I like extra innings," Gott said. "I think it measures the depth of the team to some extent." Bochy has been part of some thrilling extra-inning games as well, including Game 4 of the 2012 World Series against the Detroit Tigers that went 10 innings and a marathon Game 2 of the 2014 NL Division Series against the Washington Nationals that lasted 18 innings. "I think some of the greatest games have been extra inning games, epic games," Bochy said. "We've been part of them. That's an exciting part of baseball. I'm not into the tie deal. I'd want to play until we finish." NOTES: Outfielder Austin Slater and ambidextrous pitcher Pat Venditte were optioned to Triple-A and infielder Zach Green and pitcher Derek Law reassigned. The Giants now have 41 players in camp plus one on the 60-day injured list (Johnny Cueto).